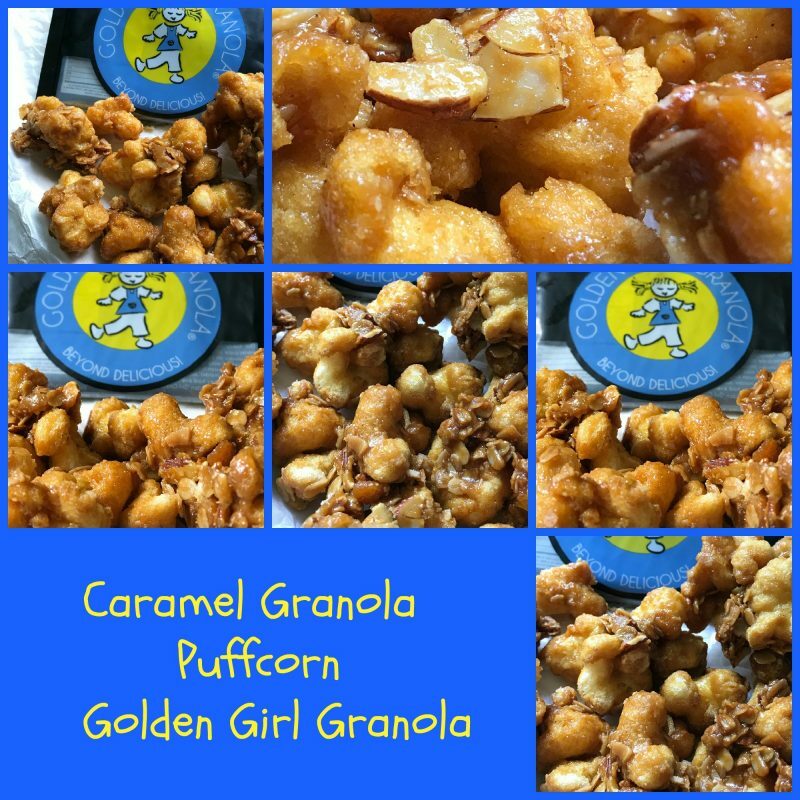 We have entered our original summertime snack recipe for Caramel Granola Puffcorn in Golden Girl Granola’s 2018 Blogger Recipe Challenge! Golden Girl Granola is beyond delicious and it truly is. Golden Girl Granola uses the finest, all-natural ingredients, is locally produced, with locally-sourced ingredients, whenever possible, hand-crafted in small, artisan batches in a wheat-free and gluten-free kitchen. Golden Girl Granola is a family-owned business located in Shirley, Massachusetts that makes the best-tasting artisan granola in New England. They bake and sell loose granola in 10-oz bags and 2-oz snack packs. Granola Girl Granola is made with the highest quality natural ingredients and perfecting them into granola heaven or into bags of culinary marvels. Golden Girl Granola comes in seven head-over-heels delicious flavors that include Blueberry, Chocolate Decadence, Creative Cranberry, Forest Maple, Home Sweet Honey, Original and Truly Tropical. 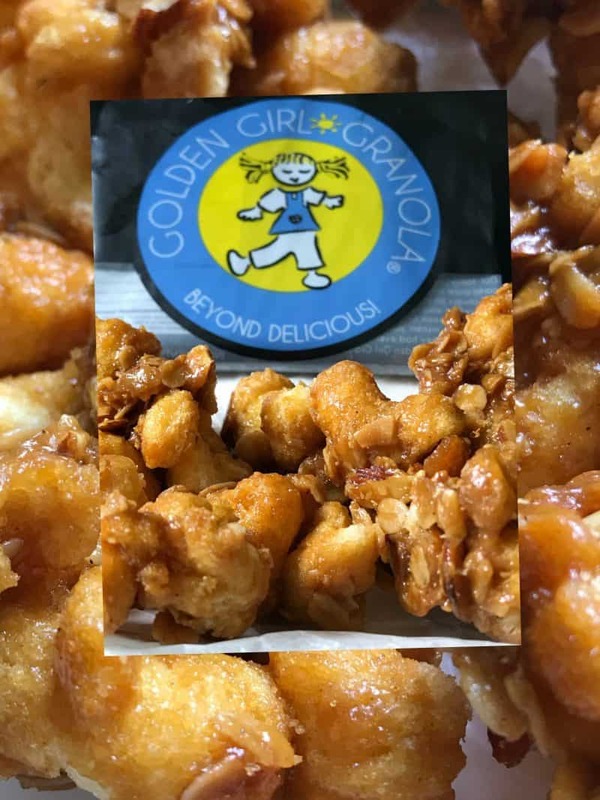 Golden Girl Granola is an all natural, whole-grain granola that is dairy-free, cholesterol-free, trans-fat free, wheat-free, with no preservatives, artificial color or flavor. Many loyal customers say it’s the best granola they’ve ever tasted! In my family there isn’t any other snack that gets devoured faster than a big bowl of Caramel Puffcorn. (Except maybe Mertks Cheese Spread and buttery crackers) I can set out a bowl of caramel puffcorn during a football game or during the holidays when company drops by and it’s literally gone within hours. 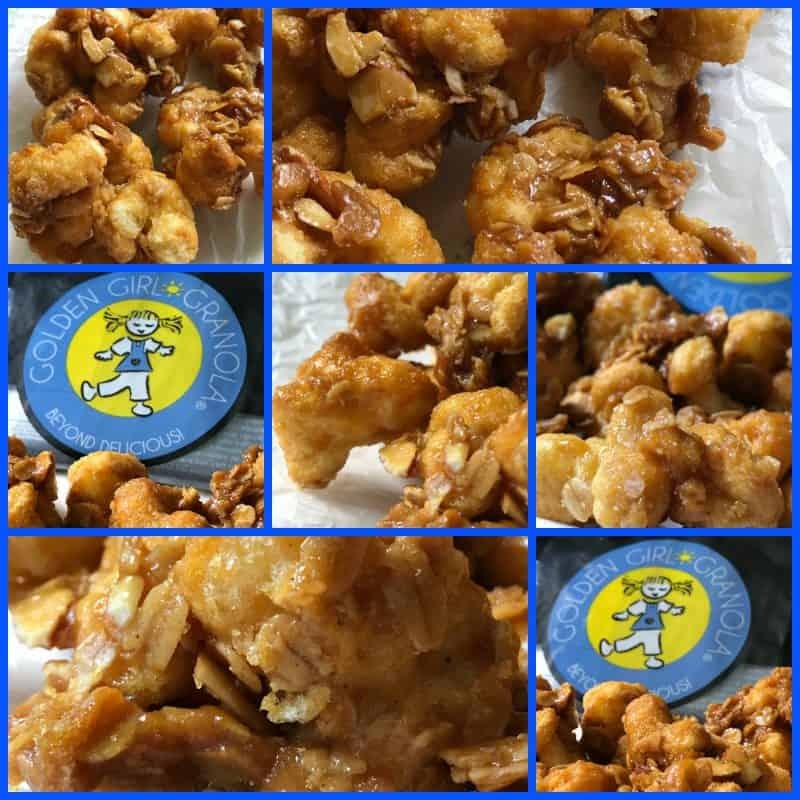 This recipe is made with a 9 oz bag of Old Dutch Puffcorn but any brand you can find in your area will do. This summer when you need a snack to bring to a backyard barbecue party, pool party or you just want something sweet to snack on while enjoying a baseball game, why not whip up a batch of Caramel Granola Puffcorn! It’s easy, doesn’t cost a small fortune to make and most importantly, your in and out of the kitchen in under an hour. Another huge plus, caramel granola puffcorn bakes for 45 mins at 250 degrees, so you won’t heat the house up either. I have made caramel puffcorn many, many times. I have made several different variations. (Check out: Puffcorn Recipes ) This variation is by far my favorite. The addition of cinnamon to the butter mixture adds great flavor but the most important addition is of course Golden Girl Granola. For this contest I chose Original Golden Girl Granola. It’s perfect in this recipe. 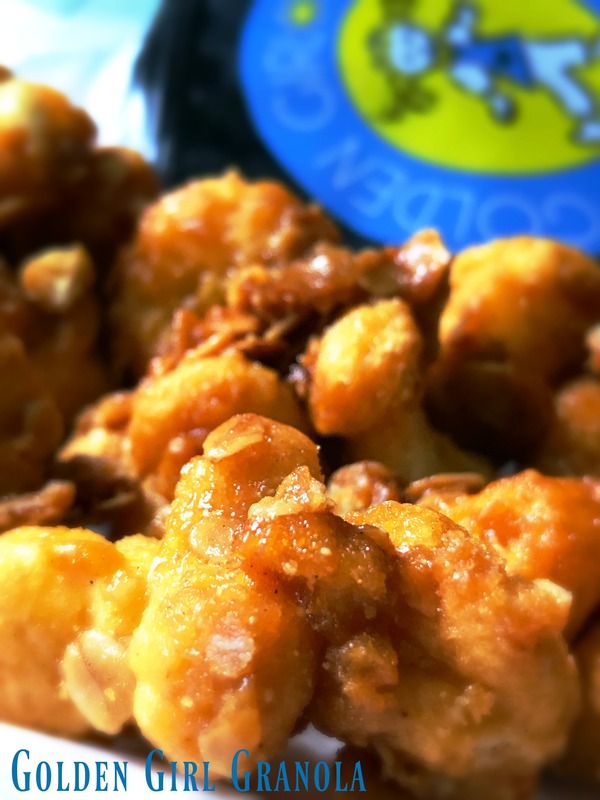 Sliced almonds, coconut and honey blends perfectly with caramel puffcorn. Pour puffcorn into a large roaster pan. Pour caramel mixture over puffcorn, pour Golden Girl Granola over puffcorn mixture and stir until mixed. Place in oven at 250 degrees for 45 minutes, stirring every 10 minutes. Pay close attention at this time, as oven temperatures vary. Remove from oven, pour on wax paper and allow to cool. Break apart and enjoy.